An appetizer serves as a prelude to a meal. It can also serve as the perfectly sized bite between meals. Appetizers are an excellent accompaniment to cocktails, too. 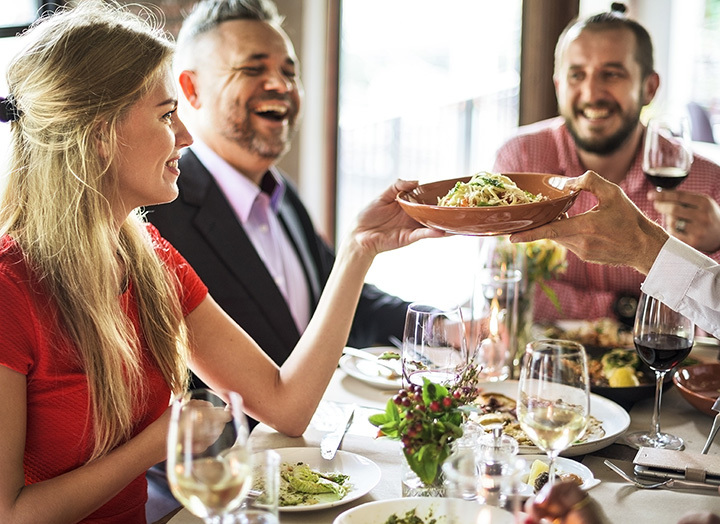 No matter when or how you choose to indulge in appetizers, North Carolina is home to a wealth of restaurants serving up some stellar options. Here are our favorites. At Basnight’s Lone Cedar Café, the seafood is sublime and everything else is farm to table fresh. The prosciutto wrapped scallops served with house made pepper jelly is an appetizer everyone should have the opportunity to try. The mix of tastes and textures simply can’t be rivaled. Not a seafood fan? Try the fresh vegetable spring rolls. They’re served with fresh, homemade peanut sauce and citrus soy. The selection of artisanal meats and cheeses in the Cheese & Charcuterie Course at Manna Ave. 123 is the perfect appetizer to share with friends. Created in portions from one to seven people, pair it with a local brew or your favorite cocktail. Consider ordering the Berry Manna Loaf—house made sourdough served with in-house churned butter—to go with the meats and cheeses. Steakhouses aren’t always known for their appetizers since their dinner portions are often hearty. An exception is made in the case of Angus Barn, however. Their North Carolina crab cakes are spectacular. Patrons can make their own appetizer platters, which is a very popular option. Choose from King Crab claws, jumbo shrimp, barbecue ribs, Oysters Rockefeller, and oysters on the half shell. Simply choose how many of each you’d like—and then dig in! North Carolina offers a bounty of farm to table options, and nowhere is that more apparent than hubarb. They celebrate the state’s bounty and it shows on their eclectic menu. The Local Cheese Plate bears offerings from several local farms. Nibble on that along with the Preserved Plate that features a seasonal array of house-pickled vegetables. Lantern serves up Asian cuisine made from local ingredients. Their appetizers are famous in the region and include delicacies like crisp local pork belly. It’s served with pickled pumpkin and is a favorite among regular patrons. Their pork and chive dumplings are made from whey fed pork. They’re tender and bursting with flavor. The Cardinal is casual with traditional pub fare, but that doesn’t make their appetizers any less spectacular. Take, for instance, their Hot Damn Ham Dip. A combo of ham, garlic, onion, cream cheese and toasted pecans, it’s downright delectable to nibble on. Their jalapeno cheddar hushpuppies are hearty and savory, too. Dip fried mac and cheese in barbecue ranch at the Pit Authentic Barbecue, and you’ll think you’ve died and gone to barbecue heaven. It’s the perfect way to begin a traditional meal of barbecue pork or beef. Their Southern-style deviled eggs are a nice touch as an appetizer, too, offering a high-protein, low-fat, but nonetheless flavorful option. Cheese and crackers aren’t what typically comes to mind when thinking of a delicious appetizer—unless, of course, it’s the pimento cheese and buttermilk crackers on the lunch menu at Madison’s. There just something about the way the rich, tangy cheese combined with the melt-in-your-mouth buttermilk crackers taste that sometimes means just one order isn’t enough. If you have the opportunity to visit 300 East, be sure to indulge in the sweet potato ravioli. Served with gorgonzola cream and toasted walnuts, it’s the perfect appetizer for two. Their baked marinated Vermont goat cheese, served with sundried tomatoes on a baguette runs a very close second. The Carolina Roadhouse is noted for their generous portions of casual fare, and their appetizers are no different. It’s many a patron who cannot eat both an appetizer and a meal without bringing a significant portion home. Their creamed spinach nachos are well worth ordering. Homemade creamed spinach and homemade cheese sauce poured over nachos is delicious. Not so sure? Then definitely try the baked potato soup. The soup is topped with ham, scallions, bacon and cheese.